The last morning of our short getaway stay at the St. Regis Monarch Beach, we woke up knowing that our little mini-vacation was over even though we didn’t want it to be. Short vacations always seem so short and there’s never enough time to truly relax and unwind. So we packed up our belongings and got ready to check out of the hotel. Before we left town, though, we wanted to grab a bite to eat to fill our tummies. Being unfamiliar with the area, we weren’t sure were we could go out and grab a good and hearty breakfast or brunch, so I started looking on the Internet. The first thing that stood out to me was a little café in Dana Point, just literally down the street a couple of miles from the hotel. The breakfast options seemed varied and a place where both my husband and I could find something to eat. Apparently, though, this place is really popular, especially on weekends and holidays, so a line was to be expected. When we arrived at the café, it didn’t disappoint. As we were searching for a parking spot, we drove right by the café and the first thing we noticed was that the outdoor patio dining was jam-packed and there was a pretty long line out the door. 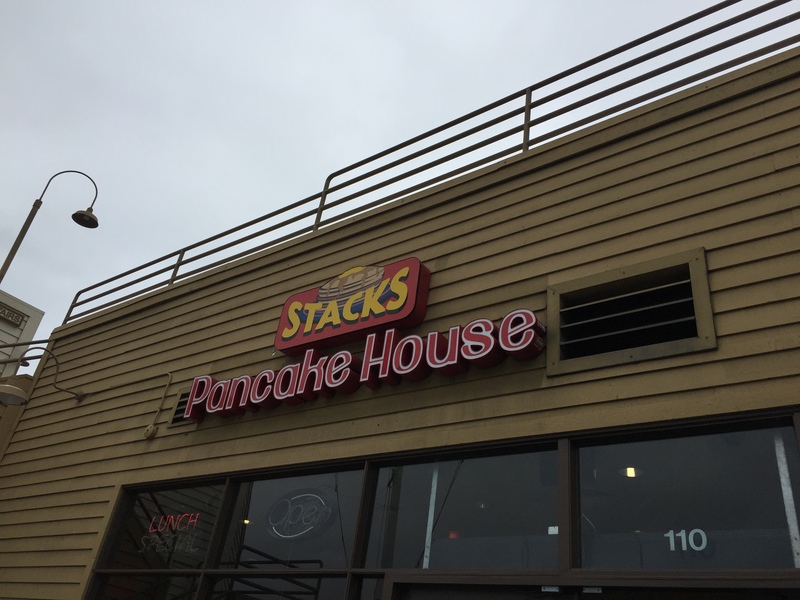 Stacks Pancake House is the brainchild of Nixon and Ovita Tanuwidjada, Southern California natives. Having worked in the restaurant industry including being the direction of operations for four different Japanese restaurants in Los Angeles, Nixon gained a great appreciation for the nuances of Asian cuisine. When the opportunity arose, Nixon and Ovita moved to Hawaii where they fell in love with the blend of Asian and Hawaiian influences in the local cuisine. When they returned to Southern California, they decided to make good on their dream of opening up their own restaurant specializing in their favorite meal of the day: breakfast. 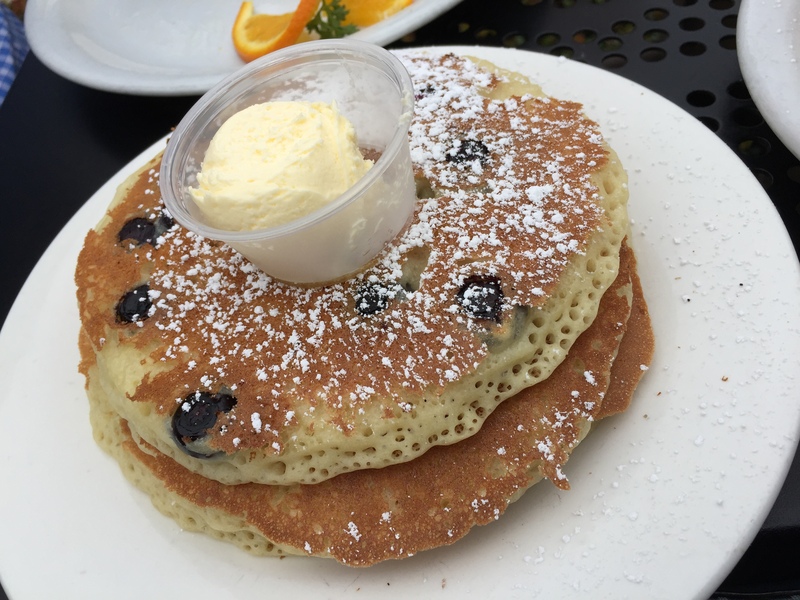 Today, Stacks Pancake House, which now has 2 locations in Dana Point and Mission Viejo, brings the best of the Hawaiian Islands and local favorites to breakfast and lunch served daily. 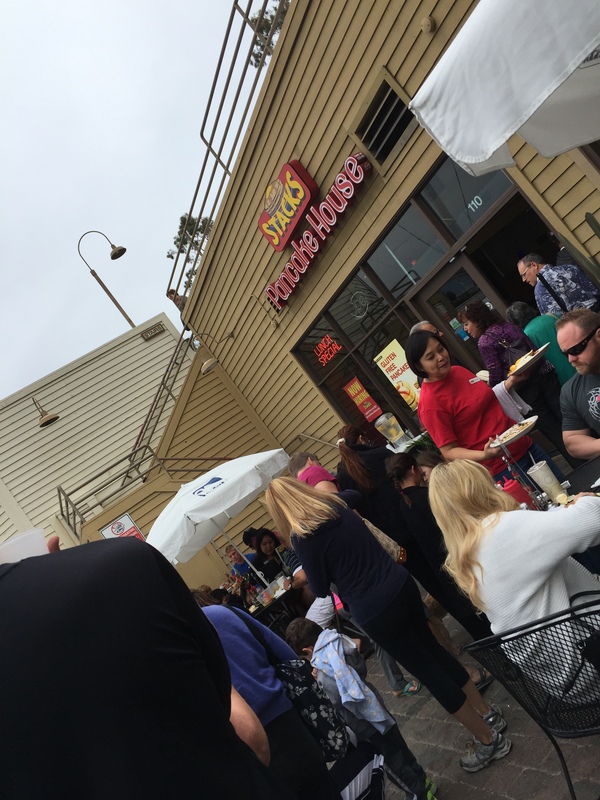 Serving the best banana macadamia nut pancakes and their signature coconut syrup in Southern California, along with Hawaiian specialties such as the loco moco, Stacks Pancake House has built a following that continues to grow. Even though there was a line when we arrived at Stacks, it moved rather quickly. While standing in line, everyone’s given a menu to look over. With a small indoor dining area, the café also features a nice outdoor patio which is terrific to sit at on a nice day. With the crowds that show up at Stacks, the staff does a nice job at keeping everything organized. Stacks asks that guests not reserve tables, but stand in line to order food first. As you approach the front of the line, a staff member finds out how many people are in your group and actually finds an empty table for you, and reserves your table with a number. This number is given to the cashier when you order so that your food can be delivered to your table when it’s ready. The whole process actually moved rather smoothly, and I’m surprised that there were no hiccups. All the food ordered at Stacks is made-to-order, but from the time we ordered to the time we were served our food, everything moved really fast and in a really organized manner considering the number of people. Since this was breakfast, I needed my caffeine fix, so I ordered a single shot latte. My husband, taking advantage of the fact that Stacks specialized in Hawaiian favorites ordered guava juice. 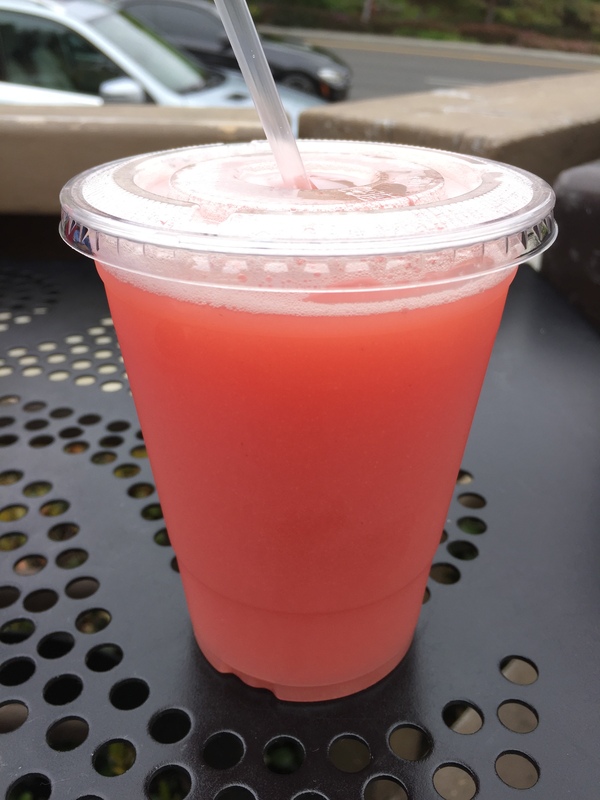 Where else can you find guava juice on the menu? Of course, he thought it was delicious and refreshing. 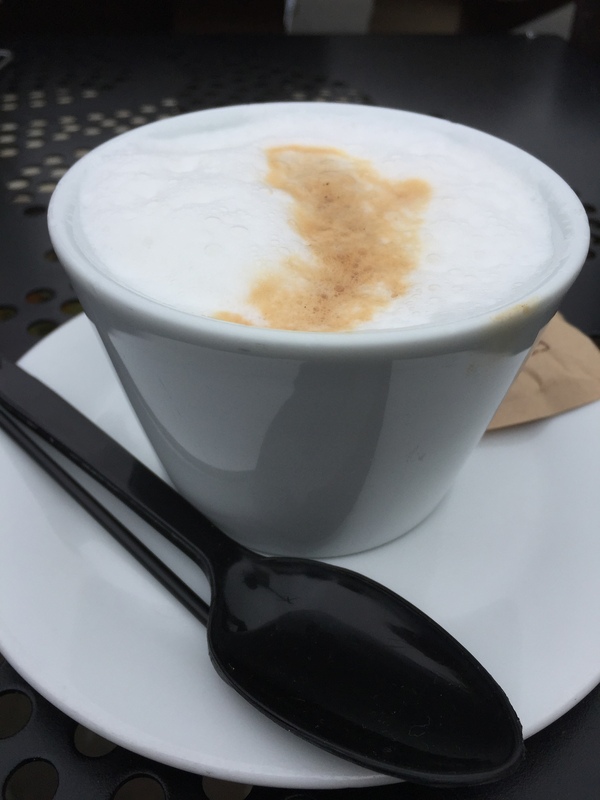 My single shot latte was nice and strong, just like it should be and really gave me a jolt to get going on this slightly cool and gray day. For breakfast, I ordered the bananas n’ cream Belgium waffle. I struggled trying to make a decision between ordering the strawberry n’ cream or the bananas n’ cream, so I actually asked them if I could add strawberries to my bananas n’ cream waffle. Luckily, they were more than accommodating, so I got the best of both worlds. I can’t resist a good Belgium waffle, and I’ve got to say this was one of the best waffles I’ve had in a while. The waffle itself was cooked perfectly, nice and crispy all along the outside, but still hot and fluffy and light on the inside. This may be, hands down, the best cooked waffle I’ve ever had. I love that they loaded the waffle with bananas and strawberries, they certainly didn’t skimp in the toppings. 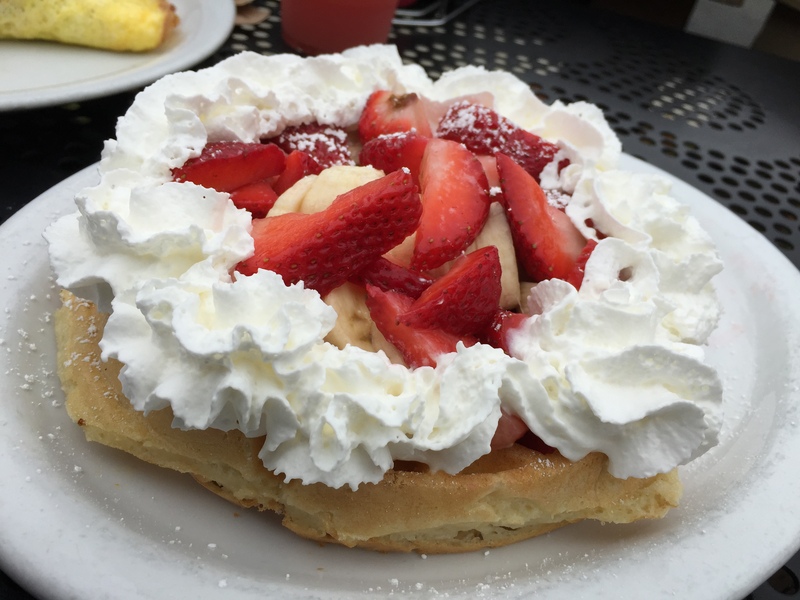 And of course, the cream came from a ring of whipped cream that circled the entire waffle. A little dusting of powered sugar to finish off the waffle and that’s all the waffle needed. No added syrup, and none was needed. Either I really loved this waffle, or I was starving, because I don’t think I’ve ever eaten breakfast faster than I did on this day. Within 5 minutes, my whole waffle, all the toppings and whipped cream was completely gone and my plate was wiped clean. It was so delicious, I seriously contemplated being a complete pig and getting back in line to order a second waffle. I totally could have finished it off too. Two serious thumbs up for this amazing waffle. My husband must have been hungrier than I was for breakfast as he ordered two items. First off, a short stack of blueberry pancakes with whipped butter. Blueberry is one of my husband’s favorite foods, not just fruits, but food, so I wasn’t surprised to see him order this. Three good-sized pancakes with a little dusting of powered sugar and some butter. Add some maple syrup and you’re all set. My husband wasn’t about to add coconut syrup to his blueberry pancakes. The pancakes were loaded with blueberries too, they definitely didn’t skimp. My husband thought that the pancakes were good and fluffy, but a bit crispy and overdone on the edges. I was envious because that’s how I like my pancakes, a bit more crispy and overdone, whereas he likes his a little bit softer and less done. He even mentioned that this would be the type of pancake I really liked. So it was more a question of style rather than taste because the taste was spot on. 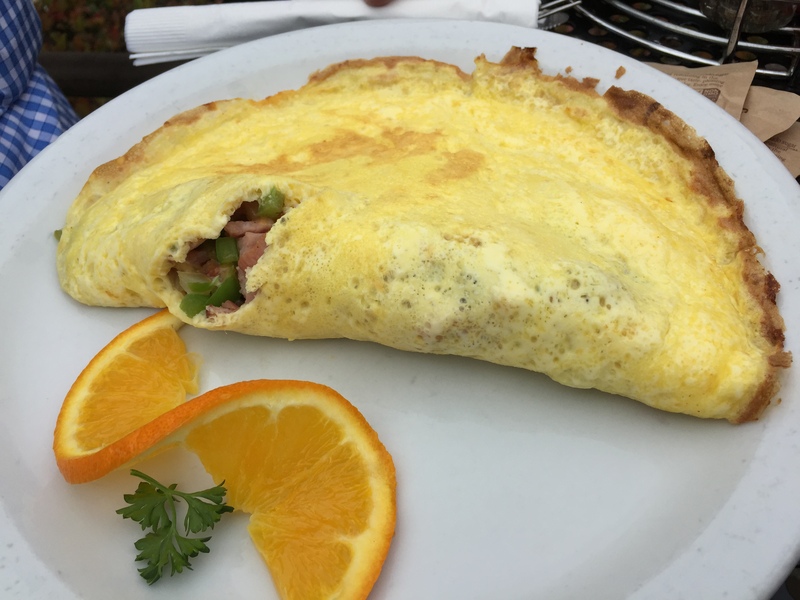 The other half of my husband’s breakfast was an order of the Denver omelette with ham, bell pepper, onions, cheddar & jack cheese. My husband wasn’t so in love with his dish as I was with my waffle. First off, he wasn’t thrilled that as an omeltte, this was more like an egg that was cooked with the stuff half folded inside it to form a half moon, rather than an omelette which he felt should have been stuffed inside with filling and surrounded completely by egg. The taste of the omelette itself he felt was good, the filling was good, though he thought it could have used more cheese (but remember, he’s a total cheese-lover) and the egg was well cooked and not runny at all. He also thought that the dish smelled terrific and made him want to dig into it. But it was obvious that while this is made-to-order, the filling had been pre-cooked and wasn’t as hot as it could have been, and lacking melty-stringy cheese when he put his fork into the omelette, he was more than a little disappointed. It was interesting that we had 2 completely different reactions to Stacks Pancake House. While my husband thought the whole thing was just “ok” and not really worthy of going out-of-the-way to eat at, I thought it was the completely opposite. Not really being a breakfast person, I’m usually “whatever” when it comes to breakfast. But Stacks Pancake house is definitely a place I’d go out of my way to dine at again. I thought my waffles were fantastic and tasty and there were so many other items on the menu that I wanted to try. My husband, while he thought his food was good and he completely finished everything, didn’t quite see what the big deal was and couldn’t understand why people were gah-gah over Stacks Pancake House. Different strokes for different folks, I guess.